Choosing to flee with the Hebrews, Kiya finds herself reliant on a strange God and drawn to a man who despises her people. With everything she's ever known swept away and now facing the trials of the desert, will she turn back toward Egypt or surrender her life and her future to Yahweh? When reading about the plagues of Egypt in the time of Moses, it is typically from the Jewish view or from Moses or his family. 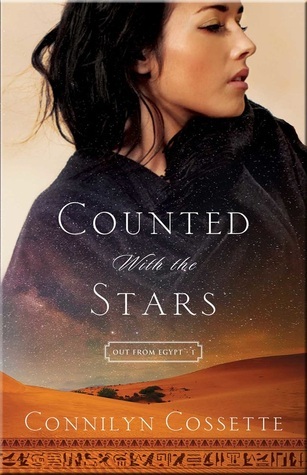 In Counted with the Stars, we see how the plagues hit Egypt from that of the Egyptian point of view, which for me was refreshing and new. It is something I've wondered, how was it for the people who fought against God's commands to let his people go. Through this story, we follow Kiya, who was sold into slavery to help pay her families debts. In this time she makes a friend with a young Jewish woman who is also bound to the house through slavery. They each suffer in their own ways, but through their trials, their friendship does grow. When the plagues start, Kiya is lost about what is happening, but with the growing friendship, Kiya learns about her friends beliefs. When the Jewish people are freed, Kiya and her family go with them. It isn't smooth sailing for Kiya and her friends and family through this journey, but it is a journey where she learns and grows. Every character plays a part and helps expands this story. I enjoyed the detail and was sad when the story came to an end. This was a wonderful story to read. I enjoyed the progression of the characters. I'm so glad that this is the first book of the Out of Egypt series. I can't wait for the next book to come out in November. When she is not homeschooling her two sweet kids (with a full pot of coffee at hand), Connilyn Cossette is scribbling notes on spare paper, mumbling about her imaginary friends, and reading obscure, out-of-print history books. There is nothing she likes better than digging into the rich, ancient world of the Bible and uncovering buried gems of grace that point toward Jesus. 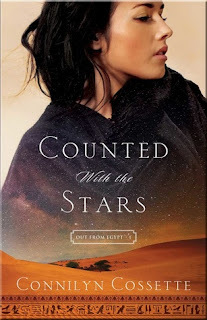 Her novel Counted With the Stars won the 2013 Frasier Contest and was a semifinalist in the 2013 ACFW Genesis Contest. Although a Pacific Northwest native, she now lives near Dallas, Texas.